Kids learn by playing. I had a pediatrician turn to my oldest son when he was four and tell him, “Your most important job is to play, OK?” As kids play their brains pick up on patterns and notice inconsistencies. They experiment, hypothesize, test, and retest. Through play, kids learn all kind of stuff without even realizing it! 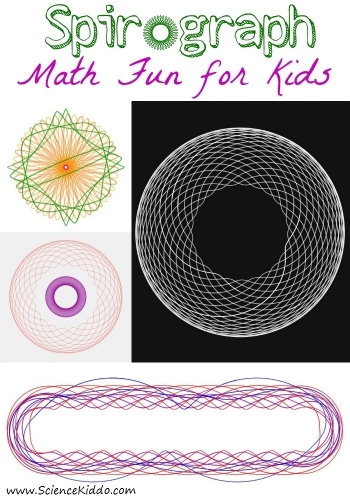 Today I am spotlighting Spirograph, an awesome tool for mesmerizing play that will help your child learn some pretty complicated math while creating beautiful art. The math behind spirograph is elegant enough for a college trigonometry course, so we’re not really going to touch on the specifics on this website for kids. (If you want to know the math behind the patterns check it out here.) Suffice it say that the patterns that are created depend on three variables: the radius of the fixed disc, the radius of the revolving disc, and the location of the pen on the moving disc. By manipulating any one of these variables you can get incredible patterns that are varied and beautiful and mind-blowingly complex. I find myself holding my breath until the pattern overlaps and connects the picture perfectly from start to finish. You may wonder where the educational value lies in letting your child play with spirograph. Sure, it’s fun and it’s art, but does it actually teach your child mathematical concepts? OK, so maybe they won’t be writing out formulas, but in playing with spirograph, in experimenting and trying all kinds of crazy combinations of variables, kids develop mathematical and scientific intuition. Kalid Azad from Better Explained wrote an enlightening article on this subject that I highly recommend you read. He said, “Math is about ideas – formulas are just a way to express them. Math becomes difficult and discouraging when we focus on definitions over understanding.” If we work on understanding the ideas first, the formulas will more naturally follow. Kids draw spirograph patterns because they are fun. In the act of playing and varying which discs they use and seeing which ones produce the illustrations they enjoy, they will notice patterns. Their math intuition gets stronger, providing a solid foundation upon which to learn more and to learn deeply. That’s something we all want, right? Right. We recently found this free game called Inspirograph where you can draw your own spirograph patterns online. You can even save and print them if you like! I highly recommend playing with it with your kids and letting them create their own beautiful art! Even my two-year-old has figured out how to use this program. She sat at the table for almost an hour one morning creating and recreating beautiful math art. At two years old she is already building her math intuition. Do you have a more tactile learner? If you are looking for a paper and pencil set for your kids the original Spirograph Set is really awesome. I also found this fun Spirograph String Art Set that would be a fun gift. I can see my kids making little ornaments and gifts for their friends with that one. 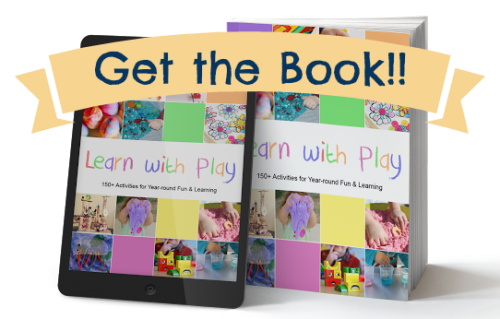 If you have a hands-on learner, one of those sets would provide hours of fun, crafting, and learning. Have you played with spirograph before? What are your favorite patterns to create? If only my maths lessons had been like this! I still remember my first spirograph – I got it when I was over 12, I think. Even at that age, the patterns seemed magical. Your post reminded me to get our spirograph out – we got it a little too early, and daughter was not able to follow the movement with a pencil without jiggling the whole thing. There are so many wonderful fun ways to teach math and also many geometry lessons built into the Spriograph drawings. Thank you for sharing at Sharing Saturday!! Spirograph is one of those timeless toys! I loved it when I was a kid, and knew there was math and geometry involved, but never thought much about it. Thanks for sharing this on the virtual Fridge! Yes, that’s exactly the point! To love it and see the patterns 🙂 Thanks for stopping over. We love it! Ha ven’t used it in awhile. I will pull it out tomorrow! Pinned.